Personal Development: 10 ways to achieve an improved you. The sets of activities and processes that can inevitably grow you intellectually, emotionally, spiritually, improve your talents, aspirations and goals as well as move you from a point in your situation to an even better position is known as self or personal development. 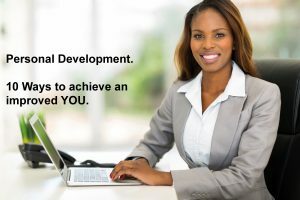 Personal development is a continuous process and gained over a period of time. It is a life long process. All you need is the vigour, drive and the desire to maximise your potential. Start NOW – there really is no time better than the present. Do not procrastinate. Take the bull by the horn and resume personal responsibility for it. Poco a Poco (Little by little) – start with a small goal that you can accomplish. Learn – this can be from others experiences and learning. I recommend you also seek to learn from mistakes of others too. Read– this isn’t flogged enough. Intellectual capacity is essential for anything worth doing. So, read. Adapt to change – the most uncomfortable situation can also be for us a place of learning. Embrace change, however it may come. Take responsibility – become your own task master. Walk circumspectly – be purposeful and intentional and what you do and how you do them. Do your best to avoid mistakes. Increase the challenge – set yourself an expectation that is higher than the former. Be flexible in growing knowledge– do what you don’t like to do as well. You never know until you actually try. Be curious to find out about things in and out of interest. Do you need support with working out a plan for yourself, reach out to us, we are listening. Register to attend our upcoming Hire Me Bootcamp on Employability Skills for March 2018. This entry was posted in Advice, Continuous Development and tagged Change, Goals, Personal Development, Self Development, strength. Bookmark the permalink. When you feel underwhelmed, try these.. Vision Boards – What can you see? Goals Temperature Check- How well do you prepare for your goals? Off Micheal Okpara Way. Wuse Zone 5, Abuja. © Copyright 2018 DV Solutions. All rights reserved.